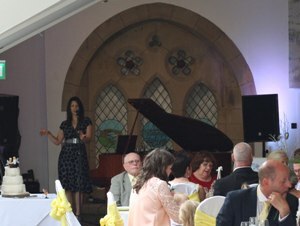 Thank you so much for performing at our civil partnership. From the moment we made contact, you guys have been so helpful. All of our guests have commented on how great you sounded and the fantastic set list. Just a quick e-mail to send our huge thanks for Saturday night. Your performance was just what we wanted and you packed the dancefloor. thank you so much for making our evening reception. Wanted to say a huge THANK YOU for a brill gig. You guys went down a storm. Loved it! Please pass on to everyone. Thank you for playing at our party on Saturday. We had the most amazing night and everyone thought you were fabulous. Thanks for helping to make the party a great success! Would Just like to say once again - a million thanks for playing Saturday for us. We really enjoyed your sets. Hope to catch you at Fresh. You are a very talented and Funky group. We loved every minute and could not leave the dance floor. Thank you for contributing to our special day in such a huge way! We had an amazing wedding and LeFunk! provided the spectacular zenith of our day! If you want to hire a band for your wedding, hire a band. But to hire THE band, go for LeFunk! 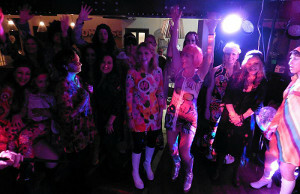 Just to say a huge thank you, you were awesome and went down really well, creating an excellent party mood. Thanks for a great performance last Friday night. The venue was packed all night and the standard of music was as good as any act I've booked over the last 15 years. I Want to send a huge thankyou to you all from me and Kinder Mountain Rescue Team for all your hard work at our charity ball on Saturday. Your music was fantastic and you made the night. I'm just writing to say thanks again on behalf of everyone for entertaining us at my 50th birthday party. Everybody loved you and I'd have no hesitation in recommending you to friends and colleagues in future. Congratulations again to Carla on your 40th at Hayfield Roundhouse and thanks again for booking MiniLeFunk! Whata great crowd - we had so much fun we even stopped the show to take this group photo from the stage. One of the most beautiful wedding venues we've played at. 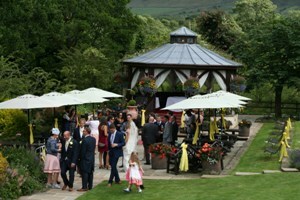 Gorgeous backdrop of rolling hills, perfect gardens, terrace and pagoda, and an atmospheric main function room that opens up to overlook it all. Musical entertainment provided throughout the day by Moody Elf, flautist Helena, Laura Jayne Hunter (Indie Lounge) and MiniLeFunk!. Congratulations again to Mindi and Matt. This was a gig we'd been looking forward to all year, and from the above picture, taken backstage immediately after completion of our set up, I think you can see why. 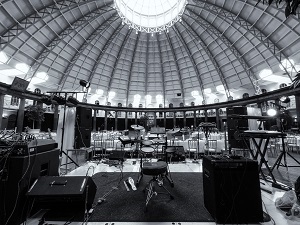 This amazing venue (the biggest unsupported dome in Europe) was the location for the wedding of Ben and Emma. Congratulations again and thank you for choosing us for all your musical entertainment. With the end of 2017 approaching we'd like to thank everyone who booked us for their weddings and birthdays over the Summer. We're proud to have been a part of the most important day of many people's lives. Thank you for the cards, gifts and flowers! We've already taken many bookings for 2018 so please get in touch sooner rather than later if you need a quote. All the best from Dave C, Paul, Laura H, Jade, Laura K, Dave B, Anna and Benn. Many of you will have experienced the fabulous voice and stage presence of our deputy vocalist Laura-Jayne Hunter (Looby). 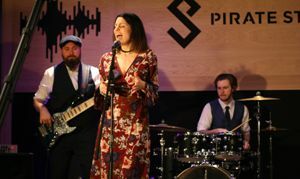 What you won't know is that Laura-Jayne is a professional vocal coach, and can be booked to perform both as a solo act or with an excellent acoustic guitarist (John Emsley). This service, under the name 'Indie Lounge' was developed predominantly to indulge her love of indie music. Smooth vocals accompanied by John’s delicate arrangements of indie classics combine their love of performing live with a passion for sharing great music. 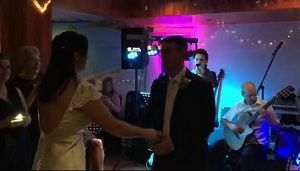 Alternative versions of indie songs make a beautiful accompaniment to a wedding reception, as an atmospheric background to a corporate event, lounge bar or restaurant. Acoustic and chill-out versions of songs from Doves, Amy Winehouse, Pulp and The Cure are just some of the names to grace Indie Lounge’s set list. Laura-Jayne continuously updates and adds songs to Indie Lounge, presenting a varied mix of past and present-day indie, pop and rock. When LeFunk! Are Already Booked ..
We often get enquiries for dates on which we're already booked. 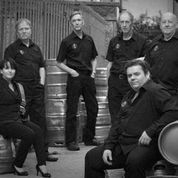 In these circumstances we always recommend The Rumble Fat Band who we know are a quality act and a great bunch of people to deal with. Check out the Rumble Fat Band Website. On March 11th we spent the day filming a medley of songs at Pirate Studios performed by the four piece band. The video has now been released and we love it! Click here to watch the Video and Many thanks again to Digital Film Makers UK. 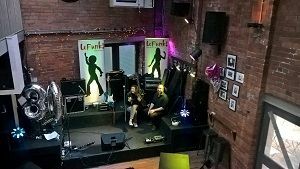 On January 29th we've spent the day filming a medley of acoustic songs at Upper House Hayfield performed by the acoustic duo LeLounge!. 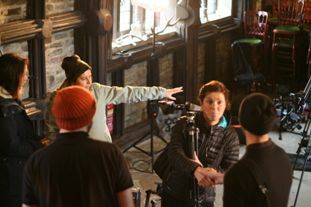 Watch out for the video release around mid February! Many thanks to Upper House Hayfield and Digital Film Makers UK. If your browser cannot display the video above, you can watch all our videos on youtube by clicking here. 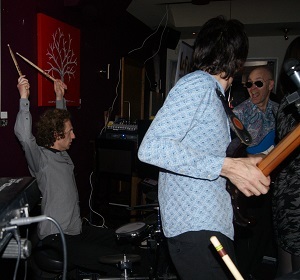 Our drummer Benn has for many years ventured out as a DJ at various Manchester city centre venues. If you’re looking to add that special touch to your evening, but want a bit more than someone who just sits behind a laptop, then 'Soul Sauce' is exactly what you’re looking for; A bespoke service where everything happens right in front of you. 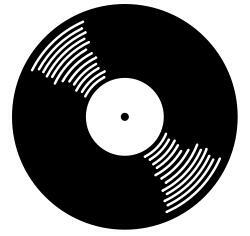 No hidden technology, just a pair of record decks, and the finest sounds from the last 50 years. DJ-ing as it should be! To be fair the non-female members of the band look stupid most of the time, but this competition is to find the stupidest photos of us performing when we actually believe we're looking cool! This one taken at the Slug and Lettuce Wilmslow in 2013 is the current leader.